Rebecca and her therapist are going over Rebecca's pattern of impulsive and destructive acts of jealousy against her previous partners. Is she unsure of Henrik, her current partner? And is she fearful of her reactions to his possible infidelity? Rebecca fell head over heels for Henrik when she met him. Six years later they share the small terraced house of Rebecca's dreams and his easy charm survives. But as Rebecca's doubts over his fidelity grow, so does Henrik's evasiveness. This evening Henrik's eyes do not meet Rebecca's as he loads textbooks into a bag, explaining that he is going over to Axel's to study. As he leaves the house Henrik considers ringing him. Axel had crossed Henrik's path for years on and off, a casual friendship. But now – having ended up on the same archaeology course together and since the Istanbul field trip when Henrik and Ann-Marie began their affair – Henrik regards Axel as a close friend. At Ann-Marie's building he phones Axel to warn him on the cover story; to tell him that the lying will soon be over because Henrik has made his decision and it is Ann-Marie that he wants. Back at their home, Rebecca has found Henrik's book bag shoved into the back of the hall closet. She phones Axel but gets no answer. Her nerve breaks and she rings around Henrik's other fellow students, freezing when one girl suggests that he may be with their tutor, Ann-Marie. One sleeping pill and two hours of drugged sleep later, Rebecca heads out towards Ann-Marie Karpov's apartment. Camilla Ceder's second crime novel BABYLON continues the story of Police Inspector Christian Tell and Seja Lundberg, a young journalist who is now Tell's girlfriend, from her first novel FROZEN MOMENT. In BABYLON Tell is presented with a murdered couple, an archaeology professor and her student lover, together with a jealous girlfriend, Rebecca Nykvist. It doesn't take long for the police to uncover Rebecca's record of assault and harassment against two previous boyfriends. However, whilst Rebecca is being questioned by the police, the home she shared with her murdered partner is burgled and ransacked and the plot begins to spread wider than the jealousies of a young Gothenburg couple and starts to point towards events that began with a student field trip in Istanbul and the darker side of archaeological treasure. A native of Gothenburg herself, Ceder has worked and studied in social sciences and psychology and her characters are firmly drawn and established; they have a true effect upon each other, painting a picture of independent lives intersecting, rather than cardboard signs guiding us to "whodunnit". Given the safe hands of the book's English translator (Marlaine Delargy has worked with Johan Theorin, Asa Larssen and Lars Kepler amongst others) who believes that first and foremost the "translated book must read well in English", BABYLON not only tells its characters' stories well, it expresses it to English-speaking readers smoothly and naturally – sadly something not always achieved in translations. This is a well-plotted, subtle, psychological thriller that nevertheless had me turning its pages with increasing speed as it drove on to its exciting final race against time. 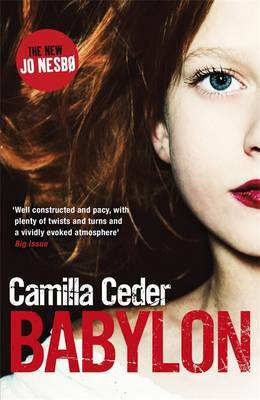 For a classic, socio-psychological, Scandi-crime read with a good final punch of suspense, I recommend BABYLON and look forward to more from Camilla Ceder. Read another review of BABYLON.